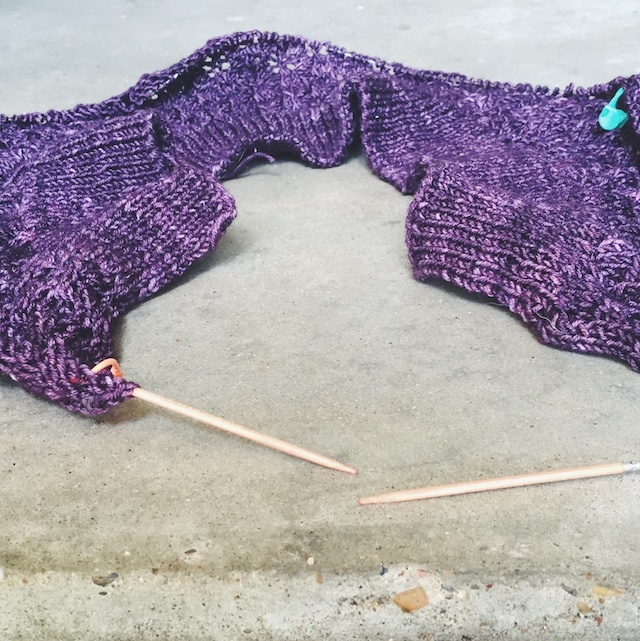 Have I mentioned how much I enjoy the Little Bobbins Knits podcast? I think so. Dani has a quiet, friendly way about her that feels like I'm having coffee and knitting with a friend. There's a loving vibe in her approach toward handcrafting, family, and friendships. It makes a nice little space for other knitters online to visit. I find Dani's projects very inspiring, too. Sometimes they lead me to try things I wouldn't ordinarily. For instance, her sock yarn blanket was among those that looked like such a comfy, sensible use for extras, the pragmatic side of my brain couldn't resist casting one on. I also don't know if I would have ventured very far into shawl knitting without Dani. 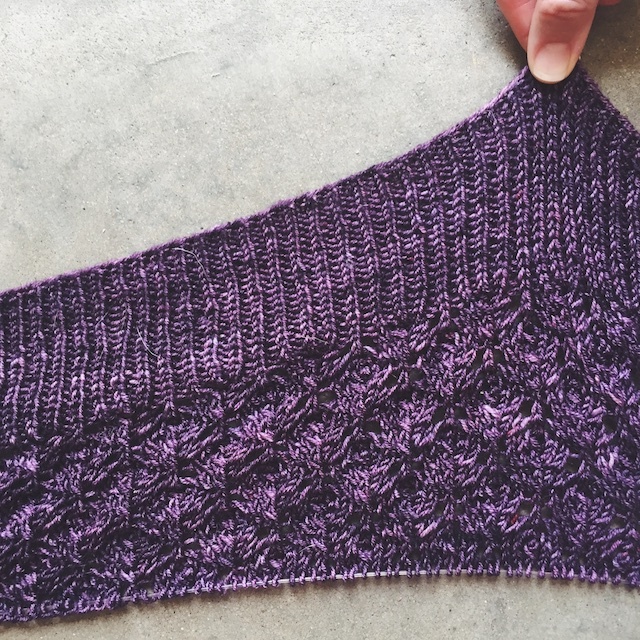 Her Instagram feed is full of beautifully soft images of socks and shawls in various stages of creation. That is where I first heard about her podcast, which I now watch every week. Who would think I would be joining her and Bobbins, from their home in England, all the way from my patio in Texas every week for a little respite? As you can imagine, the podcast only further enabled my knitting habit. 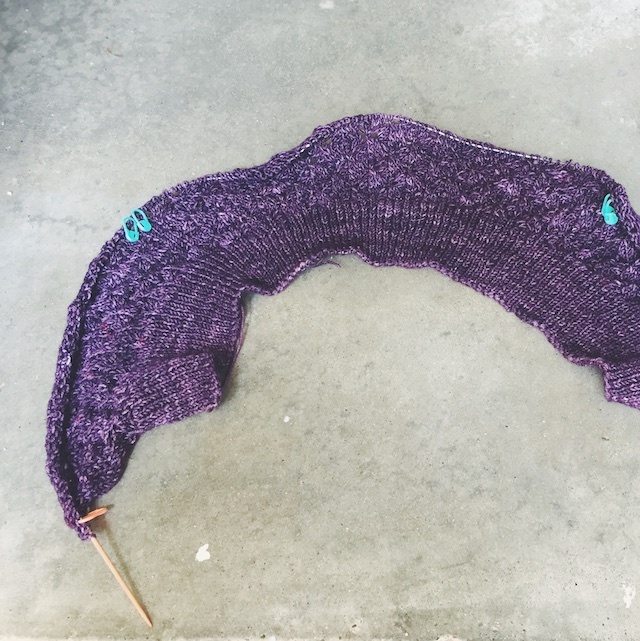 I have now knit my third or fourth shawl and I bought a couple of skeins of Hawthorne, on sale, just to make a Campside Shawl after seeing how hers turned out. There will also be more socks, I'm sure. All of this is to say that I am really enjoying plugging away at my Pomme de Pin with Dani, and the rest of the group, for the Purposeful Stash-along. Believe it or not, I am a little worried I got my ribbing too tight. That has never, ever happened. You probably saw that coming when I said I was using size 0 needles on it. Sigh. I'm not turning back, but will employ every method of blocking magic I can to ease it up.